So what exactly happens when you're a major train operator and you suddenly make it free for passengers to take bikes on your trains? We know that some rail operators in various parts of the world would have you believe that chaos would ensue and that they would lose passengers. Numbers from Greater Copenhagen and Danish State Railways (DSB), however, seem to indicate that the opposite is true. 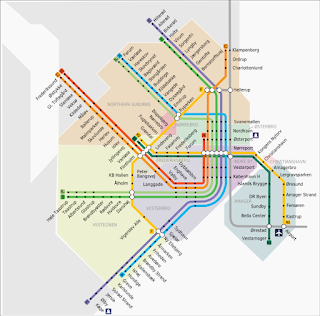 The S-train network that serves Greater Copenhagen is arguably the most integral part of the public transport mix in the region. Buses, Metro and regional trains are vital parts of the network, but the red S-trains stretching out into Europe's third-largest urban sprawl are in many ways the backbone. 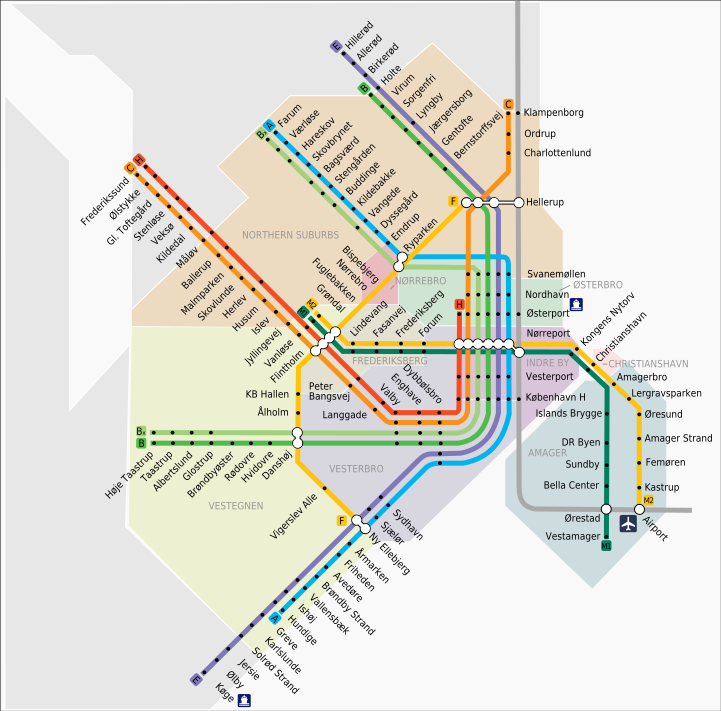 The S-train network - with 2 Metro lines at bottom right. Bicycles were allowed on the trains for a fee, which was never prohibitive. Until 2010, that is. In that year, DSB announced that bicycles would be made free on all their trains. They announced it with pride and in style and launched a comprehensive awareness campaign with creative solutions. DSB made the decision based simply on a business case model. They figured that more passengers - both commuters and users travelling in their free time - would take the train with their bikes if it were free. Six years later... how's THAT working out for them? 'Rather well' would be an understatement. 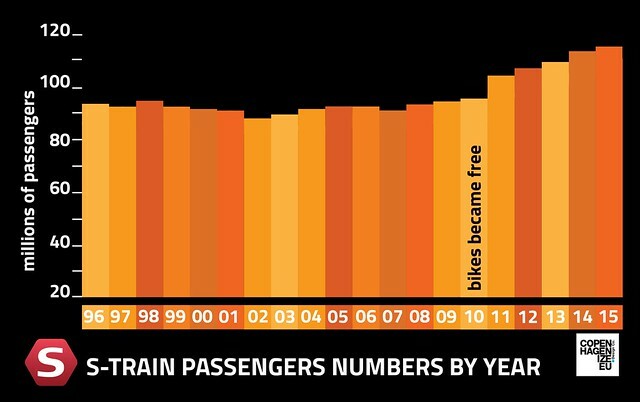 The number of passengers taking a bike on board rose from 2.1 million to 9 million. A total, whoppping passenger increase of 20%. And it continues to rise. The loss of income from ditching the bicycle ticket has been paid off several times over with the increased passenger numbers. It is estimated that almost 10% of passengers now take a bike with them. Indeed, when asked in a survey, 91% of passengers were positive about the possibility to take bikes on the trains. 27% of the cyclists on board responded that they wouldn't have travelled by train if they couldn't take their bike with them. 8% even said that they travel more by train now that it is free. In May 2009, before it was free, 188,000 bikes were taken on the S-Train network. A year later, after it was free, 630,000 bikes were taken on board. And that continued to rise. In order to meet the demand, DSB redesign the compartments on all their trains and created so-called Flex Zones with fold up seats and bike racks beneath each seat. 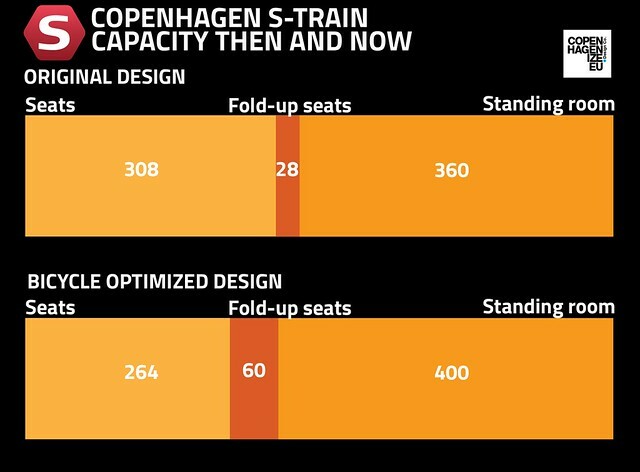 They adjusted the seating on all trains, as seen in the graphic, above, and now every train has a capacity for 60 bicycles. 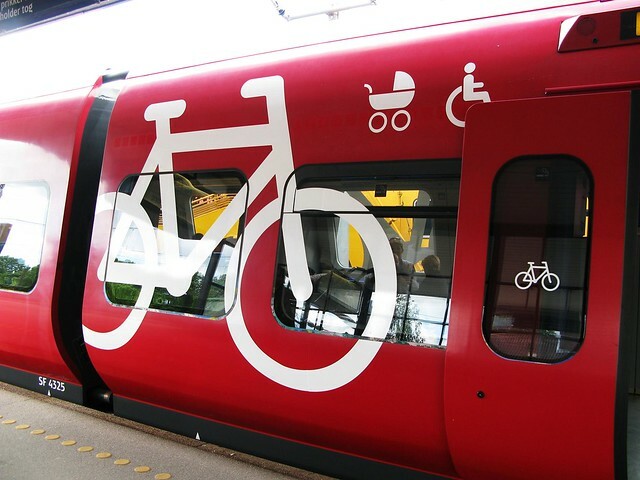 The redesign also included a comprehensive reworking of pictograms and the implementation of a one-way system to ease conflicts when bikes are rolled on or off the train. 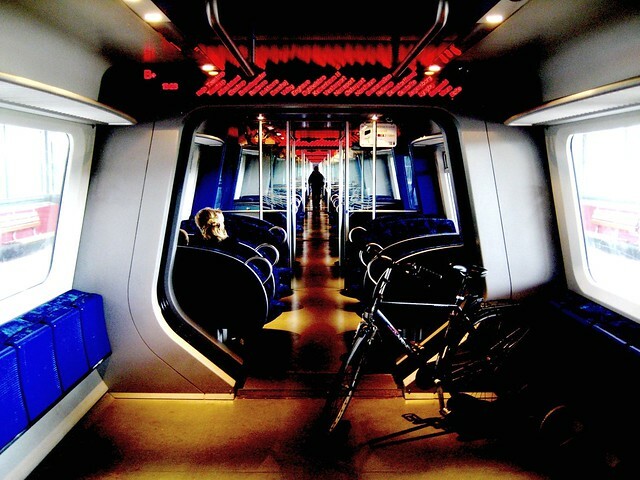 The spacious bicycle compartments are located in the middle of the train set, since DSB research showed that the seating in the middle of the train was less popular with passengers. Providing more bicycle parking at stations, especially the main stations in the Capital Region, remains a challenge. Nationally, bike parking at train stations is at a high capacity and on this point, Denmark lags behind cities in the Netherlands. Although Dutch national rail operator NS prefers having customers travel without their bikes and therefore parking at stations is more of an issue for them. Nevertheless, Copenhagenize Design Co. has proposed 7550 bike parking spots behind Copenhagen Central Station with this design. 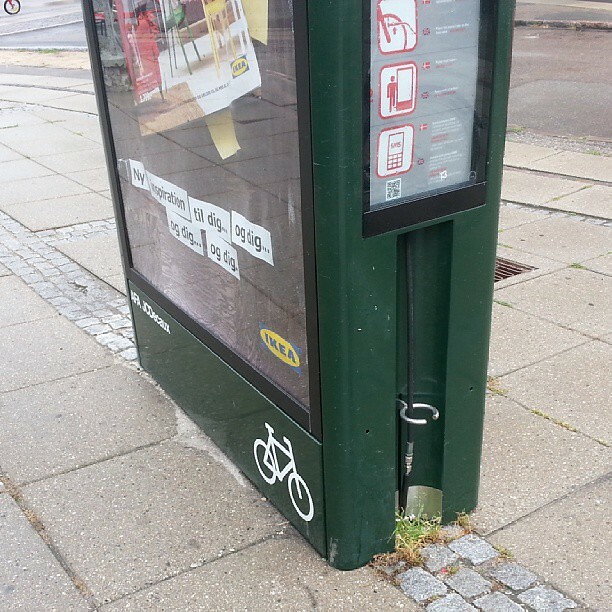 Continuing with their work to encourage bicycles on trains, DSB has toyed with the idea of putting bicycle pumps on board trains, but so far they have gone with bicycle foot pumps integrated with advertising facilities outside their stations. A pragmatic approach coupled with a cool, business decision has paid off for DSB. The bicycle should and must be integrated at every step of peoples daily lives if a city is to be truly bicycle-friendly.